BEAUTIFUL !!! Unique on the West Coast. The 34' Sabre HT Express! Quality, Strength & Beauty exudes from this Maine Built, Down-East styled vessel. This Elegant Hard Top Express is powered by Twin Yanmar 380 HP engines and will cruise at 22 KNOTS with a maximum speed of 30+ KNOTS. IMPRESSIVE. 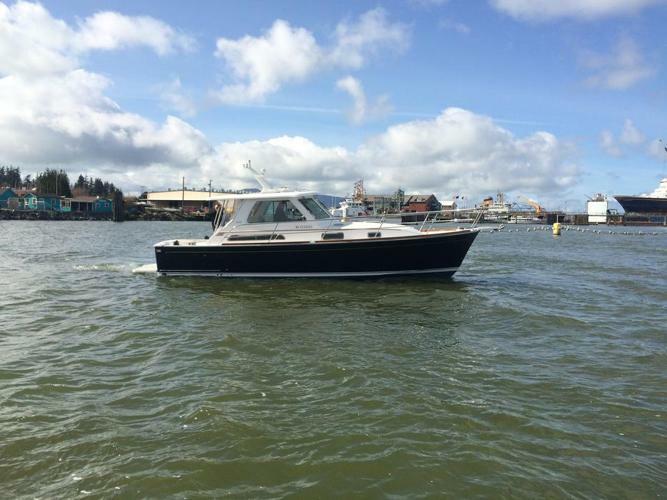 All the cruising comforts including: Marine Air Systems AC/Heat Pumps, 9 Kw Onan Genset, Stidd Chairs for Helm and guest, Raymarine Navionics, Luxury Interior, Ice Maker & 2 Separate Fridges. Below Deck you'll find an Owners Suite featuring a full Queen berth and L shaped settee with matching ottoman. This Sabre is also equipped with TROLLING VALVES on each Yanmar for the fishing enthusiast! PRICED AT 289,000 USD THE PRICE DISPLAYED is CAD converted at time of posting.